NASA dropped a bombshell this past week: The Kepler Space Telescope has discovered the most Earth-like planet to date. The rocky planet is slightly larger and warmer than our world, but it orbits a star and has the right conditions for liquid water. Meanwhile, the search for alien life goes on — and Stephen Hawking gave his support to a $100 million project seeking to find out if we’re alone in the universe. Exploring distant worlds is a challenging endeavor — last week NASA proposed a novel robotic spacecraft that could harvest wind energy while surveying gas giants like Jupiter. And the Smithsonian Institution launched a Kickstarter to save Neil Armstrong’s moon landing space suit, which is starting to fall apart after years of storage. What if you could point a gadget at an apple and instantly know how much sugar it contained? That’s the promise of SCiO, a tiny hand-held device that can measure the molecular footprint of virtually any object. In other tech news, designer Kristof Retezár created an amazing gadget that harvests water from the air while you ride your bike so you don’t have to stop for fill-ups. MIT researchers demonstrated a water filter made from a tree branch that can remove 99 percent of E.coli bacteria. And researchers developed a 3D-printed bottle cap that can tell you if the milk’s gone bad before you take a sip. 3D printing is also progressing on the macro scale — last week a Chinese company showed just how far 3D-printed architecture has come by assembling an entire villa in less than three hours. 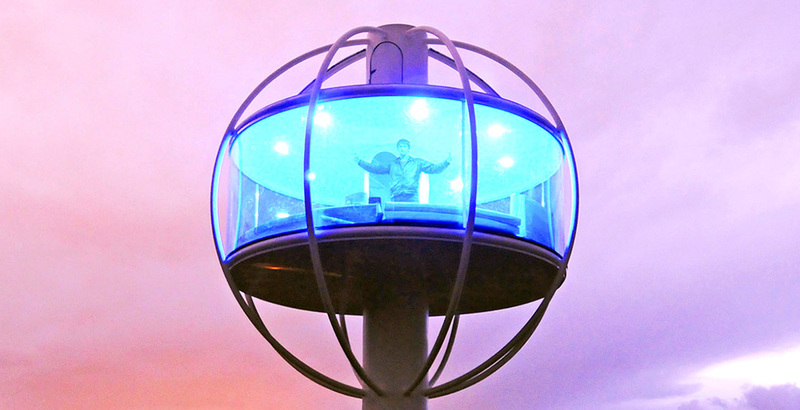 If you’re looking for something even more futuristic, we present you with the Skysphere — a solar-powered home in the clouds that responds to the sound of your voice. City dwellers will swoon at this tiny apartment that packs an entire two-bedroom house into a single space. The secret? A hidden bed that drops down from the ceiling. And just for fun, we showcased the work of Nathan Sawaya, who makes incredible large-scale Lego sculptures of comic heroes and villains.